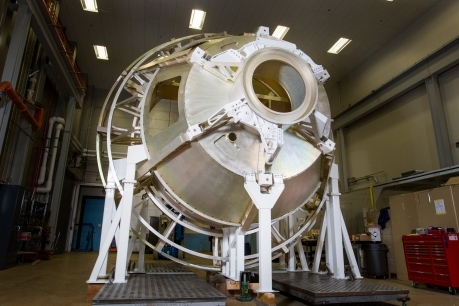 May 13, 2015 – The construction of an Orion crew module and crew module adapter full-scale mockup has been completed at Lockheed Martin’s Littleton, Colorado facility. The mockup was transferred to the Orion Test Lab (OTL) on May 13, 2015 where engineers will configure it with the exact harnessing, electrical power, sensors, avionics and flight software needed to support Exploration Mission-1 (EM-1). Orion’s team of engineers will use the mockup to verify the configuration of these vehicle components for EM-1, which ultimately saves assembly time and reduces risk. The mockup will then be connected to hardware emulations of the full EM-1 stack (Orion crew module, European Service Module, second stage booster, and the Space Launch System) as well as ground support equipment. Once it’s connected, the team will simulate and test every aspect of the EM-1 mission from launch to splash down. NASA’s EM-1 mission will launch an uncrewed Orion spacecraft to a stable orbit beyond the moon and bring it back to Earth to demonstrate the integrated system performance of the SLS rocket and Orion spacecraft. Colorado-based Lockheed Martin Space Systems leads the Orion industry team as the prime contractor building the Orion spacecraft. Orion will carry astronauts on deep-space missions beyond the moon, to asteroids, and eventually Mars.